This Saturday #1 LSU (12-0) plays #14 Georgia (10-2) in the SEC Championship Game. LSU had an undefeated regular season for the first time in school history. They have wins over 3 top 5 teams in the nation (Alabama, Oregon, Arkansas) and soundly beat other top 25 ranked opponents (Auburn, MS State, West Virginia). LSU has the most BCS National Championships in history and are a two touchdown favorite over the Dawgs. 1. Georgia is peaking at the right time and riding a 10 game win streak with HUGE victories over 2 teams with winning records: Georgia Tech and Auburn. 2. Aaron Murray is the best quarterback in the SEC and if the LSU defense has a weakness, it is defending against the pass. Although, the bayou bengals do have 3 NFL players in their secondary including the Honey Badger who is one of 5 players nominated for player of the year in college football. 3. The SEC Championship Game is played in the Georgia Dome which is virtually a home game for the DAWGS. LSU could be looking ahead to the BCS National Championship Game and a rematch against Alabama in the Superdome. It is the perfect trap game. 4. Uga is one of the best mascots in college football. 5. If Georgia wins, I will not hear the end of it at Graystone Church. 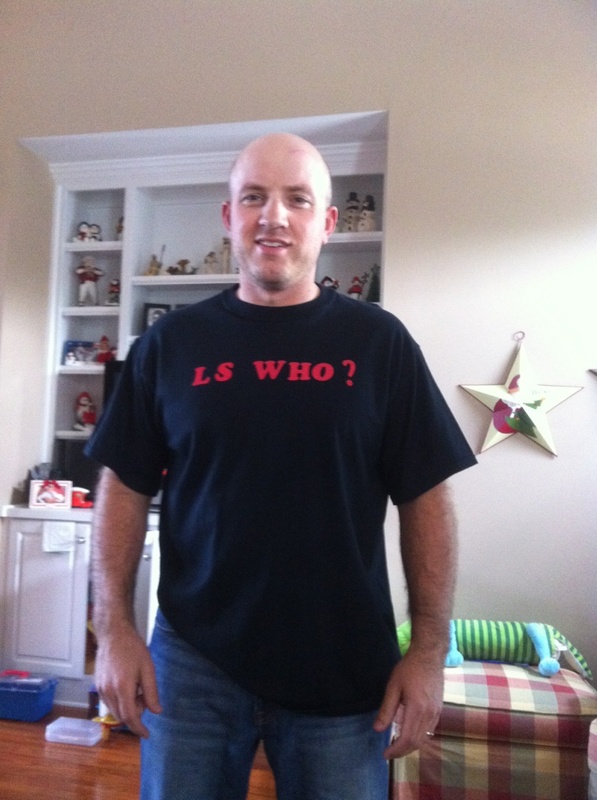 On Sunday morning, there will be a few knuckleheads in the congregation wearing homemade black T-shirts with red letters saying L S WHO? But I won’t have to wear UGA gear, because none of them are confident enough in their Dawgs to put a friendly wager down. On another note, this Saturday, December 3rd, is the 17th anniversary of the day that I dropped to one knee, put my life’s savings on Jennifer’s finger and asked her to be my partner in life and ministry. Let’s just say, “I am GRATEFUL!” And God is good!